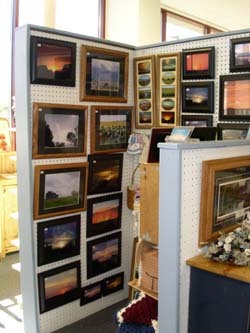 The photos in the black frames are North Dakota Sunsets, Series 1 and Series 2. Sizes are 8"x10", 5"x7", and 4"x6". The photos in the 11"x14" brown frames with black mats are the first four in my North Dakota Scenes series. You can't see them well, but they include a rainbow over a pasture, lightning, a field of sunflowers, and a moody photo of an abandoned farmstead. I am looking for two more cheery photos for this series, but as of this writing I haven't decided on any. IMPORTANT: I will not ship framed photos! If you wish to have them mailed, they will be matted instead of framed! Sunsets will have a black mat. Farm scenes will have a black or white mat--you can give a preference, or let me choose which I feel looks best with that photo. I will consider matting in other colors depending on what is available to me.